A latin term that means “about minimal things” is - ironically - taking on a huge significance for Canada in the re-negotiation of NAFTA. The de minimis level -also referred to as the low value threshold - refers to the value below which duty and taxes are not charged. Currently, most items valued under $800 US can be imported duty free to the USA. Under the new USA Canada Free Trade agreement (USMCA) imports to Canada valued over $40 CAD are subject to duty and taxes. Express shipments valued under $150 CAD can be imported duty free (but are subject to sales tax). Section 321 to the USA versus LVS system clearance in Canada: Serving express e-commerce imports but with much different low value thresholds. Note to reader: This is blog from 2017 that has been updated (October 2018) following news of the "new NAFTA" agreement. We will have - and will continue - to publish updated blogs as the details become more clear. The pending increase in Canada’s de minimis threshold (from $20 to $40) will be the first increase in over 35 years. The $150 threshold allows cross border express parcels to be imported to Canada duty free but not tax free. Customs de minimis policy in Canada was established as a way to ensure that the government does not spend more than it collects in duties. But it has since evolved into a critical issue for “free trade for e-commerce shipments" around the world. Domestic retailers around the world - including Canada - have rallied political support to protect their home market from what they view as unfair competition. Canadian Retailers fought hard against raising the de minimis value and - at least according to their public statements - are in happy that with new USMCA de minimis levels. The final USMCA level of $40 / $150 are much lower than what American negotiators has initially demanded. USA: Most open market for e-commerce parcels. Canada: More open for low cost goods sent via express. Who is for higher de minimis? Who is against? Free trade advocates are naturally for lower import fees. 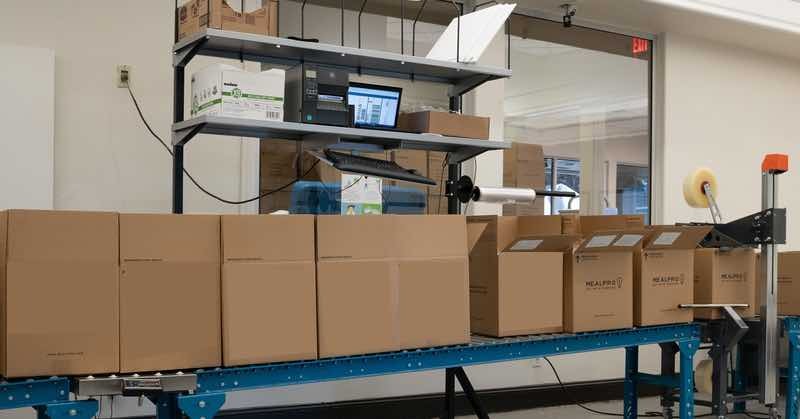 Industry groups that stand to benefit (and lobby for higher de minimis levels) include global parcel carriers (DHL, FedEx, UPS) and internet sellers E-bay, Alibaba, and Amazon. Polls indicate that the majority of Canadian consumers are in favour of having greater access to cross border e-commerce with lower duty and taxes. Framing the battle as between American retailers versus Canadian retailers is probably misplaced. Cross border e-commerce is about empowering consumers from to bye direct from the manufacturer - which is often outside of North America. At Jet Worldwide, we are getting an increasing number of inquiries from Asian retailers and shippers seeking a solution for parcel import to Canada. Contact our North American import specialists to uncover best practices for high volume import processes. The main opponents are traditional retailers. Surprisingly, US retailers were not vocal in their opposition to raising the de minimis value in 2006 (from $200 to $800). But, Canadian retailers have been strong opponents. Their arguments mirror those of Australian retailers. Australia had, at one time, the world's highest De Minimis value ($1,000 AUD). Most goods valued under $1,000 AUD could be imported duty free and tax free. But, political pressure from domestic retailers forced the government to revisit this policy. Under new laws effective this year, overseas businesses with an annual turnover of $75,000 AUD will be required to register with the Australian Tax Office (ATO) to collect GST on all goods sold, including purchases under the low value threshold of $1000 AUD. Canadian merchants would likely also accept a higher duty free level if - as in Australia - the provincial sales tax was collected. 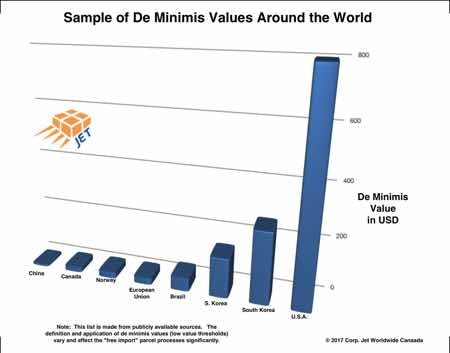 De minimis values across the world. The USA leads the world when it comes to accommodating e-commerce parcel imports. It is important to note that the bigger issue is reducing the regulatory burden - as the cost of processing parcels through customs can be equal to or greater than the duty. For imports, duty and taxes are often referred to interchangeably. But, for e-commerce imports, the point of contention is more about sales tax than duty. In Europe, for example, the Value Added Tax (VAT), averages over 20%. It is notable that the de minimis value in the USA applies to duty, not taxes: "articles that may be imported duty-free." Not "tax-free." In Canada, sales tax represents an important revenue source for provincial and local governments. Canadian retailers complain that they are under strict regulations that require them to collect and pay sales tax (PST, HST) while e-commerce imports are exempt. South Korea has a higher level de minimis for goods imported from the USA (as part of the Korean / USA free trade agreement). Perhaps the Canadian de minimis could similarly be applied only to goods from the USA? Countries in EU have two de minimis thresholds: Parcel with a value of less than €22 are free of duty and taxes. €150 duty free but VAT is applied. Canada is likely to implement a similar "multiple level de minimis." Note: having to assign and harmonized code for thousands of different e-commerce parcels - as is the case for US CBP section 321 - would alone provide significant administrative costs. Canadian consumers have benefited from internationally manufactured goods sourced and sold by domestic retailers. E-commerce provides the further benefit of being able to source products more directly from suppliers. What ever the new rules are, they should be fair and equitable for all parties. At Jet Worldwide, we believe the new Canadian de minimis to be a great opportunity for USA companies selling to Canada using our low cost express shipment delivery from the USA to Canada.